To hear residents and county officials talk, the face of Spalding County will change dramatically in the time it takes to describe what’s coming. Sun City Peachtree, an active adult community, and a University of Georgia campus evolving from a research site to include a strong teaching component are catalysts for the transformation of this county, which lies about an hour south of Atlanta in the wedge created by I-85 and I-75. Sun City Peachtree, the first Sun City active-adult community in Georgia, has put down roots just north of the Griffin city limits. “It’s not on a major thoroughfare. So a lot of people from the area haven’t been out there,” says John Rainwater, a lifelong resident of Spalding County, Griffin-Spalding Chamber of Com-merce chairman and vice president of United Bank in Griffin. 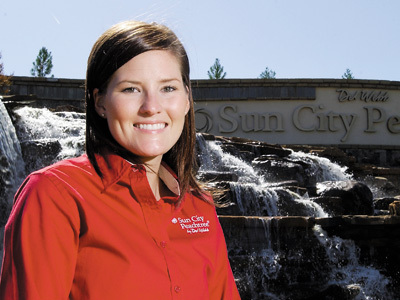 Sun City Peachtree comes complete with a cruise director, in the person of Catherine Holder, the community’s full-time lifestyle director. Holder began scheduling activities for those about to embark on their landlocked cruise in August with a Hawaiian luau, followed by a September Braves outing and other opportunities for soon-to-be neighbors to get acquainted. The first residents are due to move in this month. Because Del Webb markets Sun City developments nationally, Spalding County is preparing for an influx over the next eight to 12 years of 5,000 well-educated, upper-income citizens. Houses in Sun City Peachtree range in price from $190,000 to more than $500,000, plus mandatory homeowner’s association fees of $189 per month, which include all of the cruise-type amenities, plus maintenance for common areas and individual lawns, along with 24-hour security. County leaders are exploring ways to entice new residents into the fabric of the community. A Livable Centers Initiative (LCI) grant from the Atlanta Regional Commission is funding a connectivity study to help determine the best way to link Sun City Peachtree to downtown Griffin. Meanwhile, developers are exploring innovative ways to revitalize the downtown area. Dan Dunson purchased the circa-1943 Coca-Cola bottling facility in downtown Griffin in December 2006. In just a few months he has transformed the beautiful brick building into a trendy shopping and dining center that would be at home in Atlanta’s Buckhead district. The original Coke bottle carved over the structure’s outside entrance does little to prepare visitors for the upgrades inside. From the lime-green walls of Therapy, a women’s clothing boutique, to broad hallways with wrought-iron gates opening into businesses such as a martial-arts studio, a smoothie bar and tanning salon, and art and frame shop, the renovation maintained the best of the building’s original features, while updating the interior for today’s shopper. Only the aroma from Dunk’s barbecue restaurant that wafts through the entire structure gives any hint that this building sits in a small Southern town. The savory smell of barbecue has done its job for Dunk’s. The restaurant opened in April 2007 and by August owner Michelle Nance was planning an expansion that would triple her table space. Marshall pledged $250,000 of his own money and is seeking investors to help him reach the $6 million it will take to purchase and redo the façades of those 20 buildings. They would then be ready for new, top-tier shops and restaurants to move in. Not everyone needs to be sold on the idea of small-business development. The county was recently designated an Entrepreneur Friendly Community by the Georgia Department of Economic Development. Work spearheaded by the Griffin-Spalding Chamber of Commerce’s small business committee secured the designation, which can mean state grants to small businesses and resources for entrepreneurs. Leaders also are working on plans to make downtown more student-friendly, Smith says. With Griffin Technical College and the University of Georgia Griffin campus both growing, students are a ready market for downtown shops and restaurants. The University of Georgia Griffin campus has been primarily a research facility since it was founded as the Georgia Experiment Station in 1888. However, a brand-new, $10 million Student Learning Center broke ground in August and marks the campus’s changing direction. The Student Learning Center is being built with funds raised through a special purpose local option sales tax (SPLOST) overwhelmingly approved by Spalding County voters in November 2005. A little history about the UGA Griffin campus illuminates just how big an impact the new learning center will have on this community. The Griffin campus consists of approximately 900 acres of land, on which agricultural products are grown. A few buildings support the food science, food safety and agricultural research that have been the focus here for nearly 125 years. While PhD and master’s students have long done research alongside campus experts, classroom instruction has taken place in Athens. In the fall of 2005, UGA began offering undergraduate degree-completion programs in agricultural and environmental sciences in Griffin. Since then, several programs have been added, including a graduate program for elementary school teachers and a bachelor’s program in business. With the demand for classroom instruction established, the Student Learning Center was the next logical step. The new 30,000-square-foot facility will accommodate 800 to 1,000 students, Arkin says. New faculty and staff will have to be hired, adding to the campus’s economic impact on the community. That impact has long been considerable, he says, not just in Spalding County. The 400 current employees do agribusiness research that has implications around the world. The Center for Urban Agriculture addresses urban environmental issues including water and soil quality and storm water, while the Center for Food Safety is the preeminent facility in the world for dealing with E-coli outbreaks and other food-safety issues. The research faculty will now be teaching students the very science they are creating, Arkin says with obvious enthusiasm. Closer to home, grant money flows through the campus, trickling out into the community. Faculty who relocated to the area have often brought with them spouses who now teach in public schools or work in local businesses. In addition, the continuing education program enrolls more than 15,000 students each year, often in professional certificate programs that involve students staying in local hotels and eating in local restaurants for days at a time. “We have always been part of the fabric of industry and community,” Arkin says. The answer was found in the food quality department. Working with food quality researchers, the development authority wants to build an on-campus incubator to develop new food products and upgrade those already available. For example, Luckie says, if someone wants to manufacture and market a family cookie recipe, she could spend three years in the business incubator working with researchers to perfect the taste and safety of the recipe, the look of the cookie, even the packaging. And what would Spalding County get out of it? “At the end of three years, we hope she’d make and distribute the cookies from Spalding County,” he says. If a partnership with a university for a business incubator sounds like an unusual pursuit for the director of economic development, Luckie says he’s been thinking outside the box for several years, ever since the county ran out of industrial park land. The county has tried SPLOST funding to purchase industrial land in the past, but unlike other successful SPLOST efforts, this one failed. “The lack of industrial land has been a real challenge,” Luckie says. “We’ve been out of land for five years.” He feels it may be time to try a SPLOST again. If county residents aren’t ready for a new industrial park, it doesn’t mean they’ve been sitting on their hands. Spalding has been in the planning stage, Wilson explains. Because population growth has been slower than in the surrounding counties, “we have been able to plan. Now with the growth coming, we’re ready,” he says. County planning has included a 1997 SPLOST to fund the widening of the approximately nine-mile portion of Highway 16 from I-75 to Griffin, with the goal of creating a “gateway into the community,” Wilson says. Dundee Lake Park, a publicly owned, 200-acre facility adjacent to Sun City Peachtree, is welcoming the new residents by adding walking trails between the park and Sun City. In addition, Sun City will build and operate a kayak and canoe center on the park’s 40-acre lake at no charge to the county. What about another kind of water, drinking water? Given the drought that’s affected much of Georgia this year, can new Spalding residents expect to have their water needs met? Absolutely, thanks to the new Still Branch Regional Reservoir. The city of Griffin sold revenue bonds to raise $65 million for the reservoir and related sewer work, Smith says. The $45 million reservoir went online in January 2007, with a capacity of 22 million gallons per day and the ability to expand to more than double that when needed. “We’ve got plenty of water, which is important right now,” Smith says. He emphasizes, though, that all Georgia Environmental Protection Division guidelines for water conservation are being followed. The city also is dealing with storm water. In fact, Griffin’s was the state’s first storm water utility to address runoff issues, retention ponds and treating and regulating storm water runoff. City water officials now travel the state to help others set up similar systems. Long-term residents and newcomers alike are benefiting from the changes and enthusiasm that quality growth has brought to Spalding County.